Heartland rock fans, get excited!! 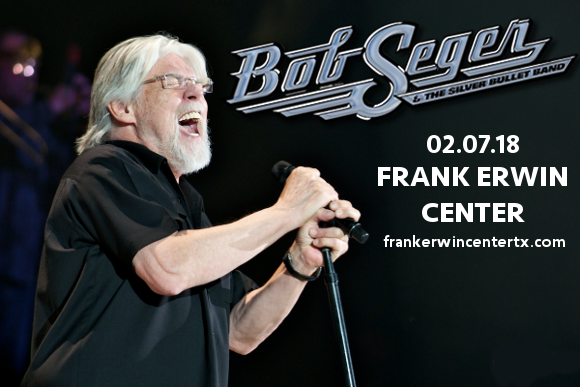 The nation’s best-loved hitmaker Bob Seger is back on tour, coming to the Frank Erwin Center on Thursday 7th March 2019!!! Get ready for the ultimate live experience – book your tickets to see the classic rocker NOW before they disappear! Kicking off his career with local success in Detroit, Bob Seger quickly became known for his distinct loud raspy tone and the blue-collar themes in his work. He went on to have a whole series of well-known hits, including "Against the Wind”, "Shame on the Moon", "Ramblin' Gamblin' Man”, and "We've Got Tonight”. He’s an inspiration to all of us and he’s determined not to let his fans down. Don’t miss your chance to catch him live – get your tickets to see Bob Seger NOW!